Even with all of the dramatic press recently about Puerto Rico’s dire state after hurricane Maria, there are a few facts most Americans are not aware of. Puerto Rico is actually part of the United States. Puerto Ricans do not have voting rights or any real representation in government. More than 40 days after hurricane Maria, 70% of Puerto Rico is still without power. If the 2/3 of Puerto Ricans without power were to migrate to five states in the midwest, their influence would make the tea party look like, well, Puerto Rico. I’m not suggesting they do it. I am trying to make a point. Puerto is Relevant, though few in government or the media seem to think so. So Far Behind Texas and Florida. Residents of Texas and Florida have many opportunities for financial aid. I live in Florida and I received payment deferments and fee waivers from my creditors. This thanks to state-offered tax breaks for those companies. FEMA and the Department of Children and Families have offered food assistance through the SNAP program for those who lost food during the widespread power outages. They handed out SNAP cards, in person, to hundreds of thousands of people in the worst hit areas. The government is offering subsidies to small businesses and paying for hotel costs incurred from evacuation. There are radio advertisements, offering federal funds for unemployment. Residents can apply for grants and loans to aid in repair costs to damaged homes. Trump and Pence visited within a few days of the hurricane. Texas has damage estimating at $30 billion. President Trump and VP Pence promised quick movement from congress in supplying aid. Pence specifically acknowledged that recovery efforts would be long-term. Pence’s wife led prayer and was filmed in work gloves helping to clear debris. This isn’t expected of them, but the show of support can be powerful. Meanwhile, two weeks after hurricane Maria devastated Puerto Rico, Trump threw paper towels at people seeking supplies as if he were playing games. With power still down to 90% of the island, he was apparently joking when he told Puerto Ricans that they are costing us a lot of money and that relief couldn’t go on forever. Meanwhile, the mayor of San Juan literally begged Trump and congress to help the Island. Trump then began another one of his twitter tiffs. Fema deployed more than 21,000 staffers to support the Harvey response,1 and they very quickly approved more than $66 million in federal aid for families. FEMA meanwhile deployed 10,000 staffers days after Maria and since, has approved 224k applications for Puerto Rico for $122 million. Florida, while suffering significant damage, was nowhere near as devastated as Puerto Rico where most residents STILL don’t have power. Thousands of engineers were deployed to Texas and Florida to rebuild the power grids. Meanwhile, a tiny contracting firm with close ties to the interior secretary secured a $300 million no-bid contract to repair Puerto Rico’s power grid several days BEFORE the hurricane hit. Between 30k-90k homes in Puerto Rico were destroyed. More than 15k in Texas were destroyed. This isn’t to say that Florida and Texas are getting showered with money. Congress is clinging tightly to the purse strings and balking at the idea of covering all of the expected costs of recovery, but it is apparent we treat mainland America considerably better than Puerto Rico. Which brings us back to the most important points. 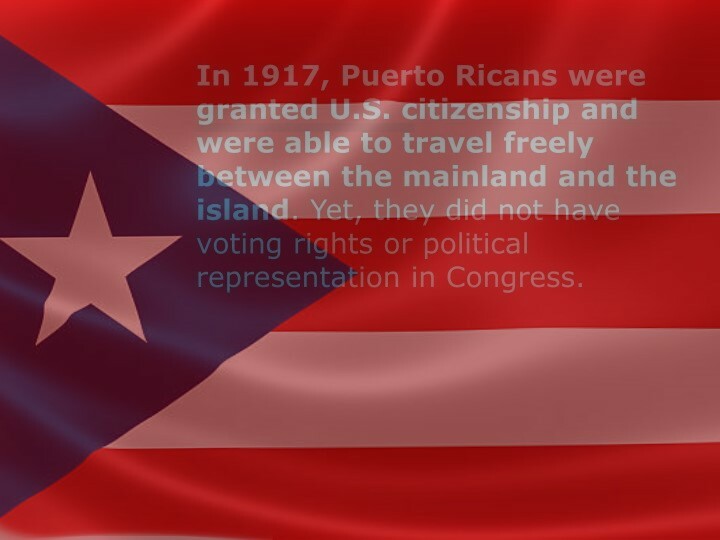 In 1917, Puerto Ricans were granted U.S. citizenship. Yet they do not have voting rights or political representation in Congress. Puerto Rico IS PART OF THE U.S. yet has no voting rights. Many people are leaving Puerto Rico. Estimates put the number so far between 100k-200k.6 About 12 percent of the population migrated permanently from Puerto Rico over the last decade(Pew). After this crisis, that is likely to climb. Now, I’m not advocating for anything, I’m not diminishing the suffering, and I’m not trying to draw attention from the current problems. I’m definitely politicizing it, because politics is about power, and they have none. So I say Puerto Ricans migrate take government, and lay down an ultimatum. Puerto Rican Caucus has a nice ring to it. Let’s ballpark that two million Puerto Ricans of voting age came across the “big water,” in Trump’s words, and settled here. This is what they should do. They should move to five Midwestern states and vote progressive liberal. They would bring 10 senators over to the democrat side and completely take over the senate forever. Hispanics historically lean left, and after the mistreatment by this administration and republican-led government, that lean is going to turn into a running tackle deep into the left. They would immediately be able to build a caucus and make Puerto Rican statehood and immigration policy a mandatory set of terms for any candidate for office. If Puerto Ricans wanted to approach this with more deep-throated, angry finesse, with tans that make Donald Trump bronze-ish with a fine patina of green with envy, they could use REDMAP conservative gerrymandering against the republicans, they could probably get more than a dozen congressional districts, re-gerrymander and get another half dozen districts. And then either the next five presidents will be Democrats with congress behind them or the Republican party will get their heads out of their collective asses and start respecting brown people.